We’d love your help. Let us know what’s wrong with this preview of Twelve Slays of Christmas by Jacqueline Frost. When Holly White's fiance cancels their Christmas Eve wedding with less than two weeks to go, Holly heads home with a broken heart. Lucky for her, home in historic Mistletoe, Maine is magical during Christmastime--exactly what the doctor prescribed. Except her plan to drown her troubles in peppermints and snickerdoodles is upended when local grouch and president of the Mis When Holly White's fiance cancels their Christmas Eve wedding with less than two weeks to go, Holly heads home with a broken heart. Lucky for her, home in historic Mistletoe, Maine is magical during Christmastime--exactly what the doctor prescribed. Except her plan to drown her troubles in peppermints and snickerdoodles is upended when local grouch and president of the Mistletoe Historical Society Margaret Fenwick is bludgeoned and left in the sleigh display at Reindeer Games, Holly's family tree farm. To ask other readers questions about Twelve Slays of Christmas, please sign up. Until a few weeks ago, I'd never heard of this author or series. I entered a giveaway contest for a cozy mystery group and won the second book late last week. Since I usually try to read in order, and I had some time this week, I got a copy of this first book, Twelve Slays of Christmas, from the 'A Christmas Tree Farm Mystery' series by Jacqueline Frost and devoured it throughout the last 24 hours. I needed a little Christmas cheer this week and this book brought it! Who wouldn't love a series ab Until a few weeks ago, I'd never heard of this author or series. I entered a giveaway contest for a cozy mystery group and won the second book late last week. Since I usually try to read in order, and I had some time this week, I got a copy of this first book, Twelve Slays of Christmas, from the 'A Christmas Tree Farm Mystery' series by Jacqueline Frost and devoured it throughout the last 24 hours. I needed a little Christmas cheer this week and this book brought it! Who wouldn't love a series about Christmas on a tree farm in Maine? I dream of moving to Maine one day, so this was a good alignment for me as a reader. I have a few other Christmas series I enjoy, and now I'll be adding this one to the list of regulars. Holly White was dumped by her fiance just weeks before her Christmas Eve wedding. She trudges home feeling sad but hopeful for a new life. She's just in time to help her parents coordinate and run their annual holiday shenanigans. This year they've added fun new Reindeer Games for 12 days to help bring spirit to the town. At least until a prominent member of the town's historical society threatens to shut them down for falling out of ancient building or land code. But then... the poor woman's found bludgeoned to death by the very wooden tree signs she complained about to Holly's father. Which citizen was so angry (s)he took matters into their own hands? Holly's determined to find out all the while fighting her attraction to the sheriff who's moved to town from Boston to get away from major crimes. I guess life never goes the way you plan, huh? As a new series, it's off to a great start. I really like Holly and Evan (the sheriff). It will turn romantic, which will be fine, but I'm hopeful that's not the center of the stories. There is also a younger guy, a reporter she knew years ago, who might give the sheriff some competition. And Caroline is a charming potential best friend, not to mention the cute and lovable parents and employees at the tree farm. I like the premise and the setting. The writing is good and felt natural for most of the narrative and dialog, only a few forced areas which I believe will disappear as the series matures. There's a mature subtle humor at times, but it definitely still falls within the cozy realm. I recommend it for all cozy fans and holiday story readers alike. Holly White heads home to Mistletoe, ME for Christmas after breaking up with her fiance a mere two weeks before their wedding date. Once Holly is home and preparing to celebrate the holidays with her family, a local woman is found murdered on Holly's family's tree farm. Suspicion falls upon Holly's dad, who was recently seen arguing with the woman right before she was murdered. Of course, Holly sets out to prove her dad's innocence and capture the real killer before he strikes again. Surprisingl Holly White heads home to Mistletoe, ME for Christmas after breaking up with her fiance a mere two weeks before their wedding date. Once Holly is home and preparing to celebrate the holidays with her family, a local woman is found murdered on Holly's family's tree farm. Suspicion falls upon Holly's dad, who was recently seen arguing with the woman right before she was murdered. Mistletoe, Maine sounds like a delightful place to enjoy all the wonderful sights, sounds, tastes, and wintery fun of the Christmas season. Reindeer Games would be such a fun family outing or even a friendly competition between friends. Oh, and the shopping… the Twelve Days of Christmas sounds superb but in my case it would likely turn into Two Days of Shopping Heaven and then a maxed out credit card! So much Christmas cheer in Mistletoe, you definitely find yourself in the holiday spirit! It tru Mistletoe, Maine sounds like a delightful place to enjoy all the wonderful sights, sounds, tastes, and wintery fun of the Christmas season. Reindeer Games would be such a fun family outing or even a friendly competition between friends. Oh, and the shopping… the Twelve Days of Christmas sounds superb but in my case it would likely turn into Two Days of Shopping Heaven and then a maxed out credit card! So much Christmas cheer in Mistletoe, you definitely find yourself in the holiday spirit! Holly White thought she would be spending her Christmas holiday getting married to her fiance and heading out on her honeymoon. Instead Holly's fiance breaks up with her with less than two weeks to go until their planned Christmas Eve wedding and she packs her things to return home to Mistletoe, Maine where her family runs a tree farm. Jumping back into working at the farm to help her parents during the busy season leading up to Christmas helps Holly take her mind off of the end of her relations Holly White thought she would be spending her Christmas holiday getting married to her fiance and heading out on her honeymoon. Instead Holly's fiance breaks up with her with less than two weeks to go until their planned Christmas Eve wedding and she packs her things to return home to Mistletoe, Maine where her family runs a tree farm. Jumping back into working at the farm to help her parents during the busy season leading up to Christmas helps Holly take her mind off of the end of her relationship. The excitement and magic of the upcoming Reindeer Games has everyone in the town excited except for those that have had a run in with the president of the Mistletoe Historical Society, Margaret Fenwick. Margaret has been on a rampage leaving lots of folks upset handing out fines in the name of the Historical Society which hasn't made her the most popular in town but Holly never expected to end up finding Margaret murdered just on the outside of the farm. Now Holly knows her family and employees are all suspects so she's determined to find out who the real murderer is to take the suspicion off of those close to her. 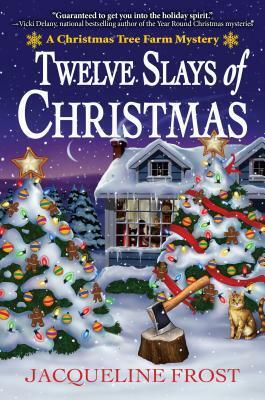 Twelve Slays of Christmas by Jacqueline Frost is the first book in the Christmas Tree Farm Mystery series. This cozy mystery series is definitely one for Christmas lovers everywhere and will certainly get readers in the mood for the upcoming holidays. From the main character being named Holly and working on a tree farm with all sorts of fun Christmas activities to the name of her cat, Cindy Lou Who the entire book just oozes Christmas and had a smile on my face for the biggest part of the book. The fun Christmas side of the story aside there was also a nice little mystery going on with a bit of suspense when Holly begins nosing about and the murderer doesn't take too kindly to it leading to threats. The local Sheriff was also a potential budding love interest for Holly as he's new to town and takes his job seriously leading to the pair spending quite a bit of time together which leads to hoping we see more of that story line in future books. In the end this one was a big ball of Christmas fun and I'll certainly look forward to more of these characters in the future. This book is cute. Maybe a bit too cute. It's easy to forget this is a murder mystery, especially because our resident sleuth, Holly, never actually solves the crime-- the big reveal is as much a surprise to her as it is to readers. The book is Christmas overload. The town is called Mistletoe, the farm Reindeer Games, and there's enough references to sugary baked goods to make your stomach gurgle. The colourful, whimsical cover design caught my attention and I wasn't disappointed. This story is a wonderful read that combines the spirit of Christmas and an exciting and fast paced cozy mystery that I couldn't put down. It left me with warm feelings and looking forward to the cold Christmas season. Wonderful characters in a village that I would love to visit. This book makes it on my Top 10 list of 2017. Grab a hot apple cinnamon tea and some yummy cookies and enjoy the magic of Christmas with The colourful, whimsical cover design caught my attention and I wasn't disappointed. This story is a wonderful read that combines the spirit of Christmas and an exciting and fast paced cozy mystery that I couldn't put down. Grab a hot apple cinnamon tea and some yummy cookies and enjoy the magic of Christmas with this mystery. Nothing gets me feeling more festive than… murder? As November rapidly comes to an end, I felt a hankering to indulge myself in a Christmas cozy. 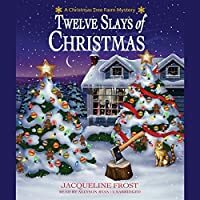 So, after asking for recommendations in a Facebook group, I decided to check out Twelve Slays of Christmas; the first instalment in The Christmas Tree Farm Mystery series by Jacqueline Frost. I did not regret this choice. Now, make no error, his mystery is not deep. In fact, there are many aspects of the story that are either cheesy, too cutesy, or just Nothing gets me feeling more festive than… murder? Now, make no error, his mystery is not deep. In fact, there are many aspects of the story that are either cheesy, too cutesy, or just straight-up unrealistic. However, with a cup of cocoa and a pair of warm jammies, I found Twelve Slays of Christmas to be just the book I needed to get into the Holiday spirit. The descriptions of Mistletoe Maine, Particularly the Reindeer Games Tree Farm, made such a perfect setting for this novel. I could imagine the delight of being there in person. Furthermore, the cast of characters that we meet through the course of the mystery were all quaint and charming (except for … you know … the killer). This fact enhanced by the delightful narration from Allyson Ryan; who did a fantastic job at bringing Mistletoe to life. Overall, I really enjoyed this cozy mystery. I hope that the author decides to continue this series as I would love to hear more about Mistletoe and its residents. I had a fantastic time with this cozy! I had heard some really good things about this book so when I noticed that my library had a copy of the audio available, I decided to give it a try. I was not disappointed. Once I started listening to this book, I didn't want to put it down. Holly White has moved back home after her fiance decided to break things off just before the wedding. It works out that she is home just in time to help out This review can also be found at Carole's Random Life in Books. Holly White has moved back home after her fiance decided to break things off just before the wedding. It works out that she is home just in time to help out during the busiest time of her at her parents' Christmas tree farm. When someone is murdered at the farm, things change quickly and everyone is a suspect. In order to get the farm open again, Holly decided to look into the murder herself and things get even more interesting. I loved the characters in this book. Holly really felt real to me. She was smart and well-adjusted. I loved that she had a great relationship with her parents. Her parents were wonderful and I thought the way they wanted to protect Holly felt very authentic. Sheriff Evan Grey was great. I really appreciated the fact that he was a capable officer. He was calm and seemed to be able to handle just about anything. I really liked the relationship that developed between Holly and Evan over the course of the story. I liked the fact that the mystery kept me guessing until the very end. There were quite a few possible suspects and a whole lot of people in town that had some kind of motive for the murder. There were several characters that I didn't completely trust. As new developments were discovered, I found myself trying to piece everything together but I couldn't figure out exactly what happened in this story until the big reveal was made. This was the first time that I have listened to Allyson Ryan and I thought she did a wonderful job with this book. I found the voices that she used for the characters really added to the story. I thought that she did a great job of expressing the characters' emotions through her reading. I thought she had a very pleasant voice that was easy to listen to for hours at a time. I would recommend this book to others. I thought that this was a very well done cozy mystery and would be the perfect choice for the holiday season. I am looking forward to reading more in this series very soon. I had a fantastic time with this cozy. The characters in this book were wonderful and I loved seeing them interact at the Christmas tree farm. I was stumped by the mystery for most of the book but had a lot of fun mistrusting some of the possible culprits. I really enjoyed all of Sheriff Grey and Holly's scenes together and couldn't help but hope for something to develop between the two of them. The narrator did a great job with this one and really brought the story to life. I do hope to listen to more of this series. This cover is getting a much coveted 5 Star rating from yours truly. Why? Because it is is just SO damn fun and festive. Fabulous use of graphics. A great representation the story. Good composition and title work as well. After her breakup, Holly is back home in Mistletoe, Maine and helping out on her families Christmas tree farm. The reindeer games are coming up, and the town is buzzing with excitement. When a member of the local historical society is murdered on the property, all eyes are on Holly and her family. Holly just can't believe anyone in this small town is a murderer and makes it her mission to find out who did it and get the family farm back in business. I enjoyed this one a lot. It was suitably festive. Well written and paced. The plot was engaging and kept me guessing right up until the end. I loved the small town Christmasy feel. I loved the characters both secondary and main. They were quirky and delightful. There is a tiny smidge of romance in this one between Holly and the sheriff. I am not a huge fan of romance in my cozy mysteries because it often feels forced or underdeveloped. This one was neither, and it struck the perfect balance. The only thing I missed was a few recipes at the end. I think it would have been a nice touch to have a few of the drink and cookie recipes that were featured in the book included at the end. All in all, though this one gets two thumbs up from yours truly. Holly White returns to Mistletoe, Maine after her fiance breaks off their engagement for a younger woman he met at the gym. The family business, Reindeer Games Christmas Tree Farm, is just what she needs to help put her life, and heart, back together. The farm, and town, are gearing up for Christmas. The Twelve Day of Reindeer Games at the farm, plus cookies and hot cocoa, are really packing in the tourists and locals. Everything is holly jolly until the head of the local historical society, Mar Holly White returns to Mistletoe, Maine after her fiance breaks off their engagement for a younger woman he met at the gym. The family business, Reindeer Games Christmas Tree Farm, is just what she needs to help put her life, and heart, back together. The farm, and town, are gearing up for Christmas. The Twelve Day of Reindeer Games at the farm, plus cookies and hot cocoa, are really packing in the tourists and locals. Everything is holly jolly until the head of the local historical society, Margaret Fenwick, is found beaten to death, her body gruesomely stuffed into the Reindeer Games sleigh display. Unfortunately the owners and staff at the tree farm immediately become suspects because the weapon happens to be a spike used to identify trees on the farm. Holly's father, Bud, was seen arguing with the annoying woman just before her death, making him look guilty. Holly knows her dad is not a killer....so she is on the case to ferret out the murderer! This is Jacqueline Frost's debut novel. I am definitely going to read more in this series! Although it's not even Halloween yet, this book really got my holiday spirit going! Great theme, awesome cover, and a fun read!! I can easily say this story embraces the fun and magic of the holiday season. Author Jacquelyn Frost creates an amazing setting for Reindeer Games, a Christmas Tree Farm located in historic Mistletoe, Maine. Many charming characters immediately felt like family and good friends to me. The protagonist, Holly, has ended her engagement and returned home to help her parents during their busiest time of year. When a local grouch, Margaret Fenwick, is killed with a stake used to identify the different I can easily say this story embraces the fun and magic of the holiday season. Author Jacquelyn Frost creates an amazing setting for Reindeer Games, a Christmas Tree Farm located in historic Mistletoe, Maine. Many charming characters immediately felt like family and good friends to me. The protagonist, Holly, has ended her engagement and returned home to help her parents during their busiest time of year. When a local grouch, Margaret Fenwick, is killed with a stake used to identify the different kinds of trees for sale, the farm is shut down as the crime scene is processed. Fortunately, Holly strikes up an easy camaraderie with Sheriff Evan Gray, an ex-Homicide detective from Boston. They wonder who would profit from Fenwick's demise? Could her close involvement with the local Historical Society be a connection? When Brie starts sleuthing around town a barrage of threats begin against her and her family and each one is more vehement than the one before. Can Sheriff Gray catch a killer before the violence escalates and ruins the beautiful Reindeer Games tree farm? I enjoyed the entire story and the feel-good ending Ms. Frost treats cozy readers to. Romance took too much time, IMO. (view spoiler)[They finally share a kiss on the last page? Yeah, I need some more lovin'. (hide spoiler)] Other than that it was a cute cozy mystery and beautifully described the Christmas Holiday season on a Christmas Tree farm that was delightful. Great narration, too. 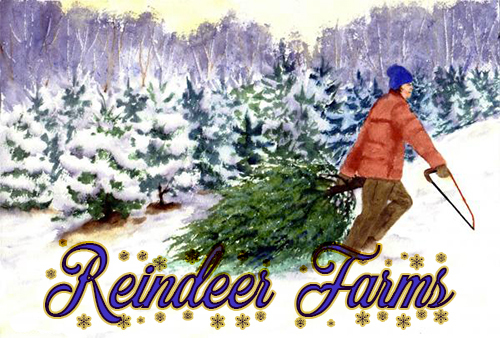 The White Family owns and operated the Reindeer Games Christmas Tree Farm, “a holiday paradise” and hosts The Twelve Day of Reindeer Games drawing tourists from near and far. Holly White was supposed to be getting married on Christmas Eve but her fiancé called it off when he met another woman. So Holly is home in Mistletoe helping her family with the festivities. Games like the snowball roll and find the pickle, treats baked up fresh by her mom, and trees as far as the eye can see. Where better to spend the holidays than Mistletoe, Maine? Then Margaret Fenwick’s dead body is found in one of the sleighs and the murder weapon is a wooden stake Holly’s dad made to mark the types of Christmas tree rows. That makes him a suspect, but Holly finds out there were several people not happy with the president of the Mistletoe Historical Society. With the farm closed for a police investigation her family isn’t making any money and the people in town for the games and their trees are not happy. Holly decides it is up to her to slay the killer or at least catch him so the games can begin. I loved this story. What a wonderful debut for this series! Ms. Frost’s descriptions brought Mistletoe and the Reindeer Games farm to life. As we traveled around, from the cafe to the guest house, from the forest of trees to the entrance gate, and even Holly’s parent’s house and the reindeer stable. Pictures formed immediately in my mind. I could almost smell the hot chocolate, the cookies and the pine trees. Her writing style makes it easy and fun to escape right into the story. The author has also created some fantastic characters. Holly is a strong women growing through a huge change. Her life is not going how she planned and soon realizes she is happy the wedding was called off. Her parents are very supportive. I like that she thinks of her dad as her personal Paul Bunyan. Her mother can be found in the cafe kitchen baking up cookies and whoopie pies, always there to talk. Holly thinks she got her creative side from her mother. Delores Cutter, known to everyone as “Cookie” has quite a past but now she runs the Holiday Mouse Christmas Craft Shop on the farm and has a pet goat named Theodore, after her late husband. Be prepared to laugh, this lady is a hoot and a holler. We also meet Sheriff Evan Gray, a transplant from Boston. He came to town hoping for a slower life never expecting to have to deal with a murder in Mistletoe. This mystery is very well written with a blizzard of twists, a couple were downright chilly. With Holly not being home for a long time and the sheriff new to the community everyone seemed to be a a suspect. Holly knew her parents had nothing to do with the murder but she knew it had to be someone who knew their way around the farm. I was right there along with Holly tried to solve whodunit. Recommends it for: everyone who wishes to get into the holiday spirit. What great fun it would be to live in Mistletoe, Maine around Christmas! Jacqueline Frost’s Twelve Slays of Christmas is one totally enjoyable holiday cozie. Holly White, the daughter of the owners of Reindeer Games Christmas Tree Farm, returns from Portland, ME as her fiancé has met someone more ‘Zen’, and he cancels their Christmas Eve wedding only two weeks before Christmas Eve. As Holly arrives home, she is determined not to let everyone in the small town of Mistletoe pity her because of the What great fun it would be to live in Mistletoe, Maine around Christmas! Jacqueline Frost’s Twelve Slays of Christmas is one totally enjoyable holiday cozie. Holly White, the daughter of the owners of Reindeer Games Christmas Tree Farm, returns from Portland, ME as her fiancé has met someone more ‘Zen’, and he cancels their Christmas Eve wedding only two weeks before Christmas Eve. As Holly arrives home, she is determined not to let everyone in the small town of Mistletoe pity her because of the breakup. Thus, Holly jumps right into all the Christmas activities, The Twelve Days of ‘Reindeer Games’ as well as assisting her mom in The Hearth, the tree farm’s shop where her mom does all kinds of baking and serves her customers a little bit of Christmas magic in the form of peppermint twist hot cocoa, hot caramel hot cocoa, whoopie pies, all kind of Christmas cookies such as snickerdoodles, Christmas chocolate chip, and reindeer gingerbread cookies. That definitely sounds like a place I would love to be! Holly, on her trip to the tree farm, discovers a dead body on Reindeer Farms property. She calls the sheriff, a relatively new person to Mistletoe, and Sheriff Gray rushes to the scene, and closes the tree farm as it is the crime scene. Holly, knowing her family needs the profits from the tree farm to live and being an outgoing person, decides to ask a few questions about the murder victim, but finds she is next on the killer’s list. She is asking too many questions. Sheriff Gray, 31, has told Holly that as sheriff it is his job to solve this case, and she should back off. A fun Christmas themed mystery - small town with quaint decorations and a likable heroine. After breaking up with her fiance, Holly comes home to help out her parent's family business just in time for Christmas. Apparently they go all out with themed parties and actual reindeer themed games. Naturally a murder ruins the party, and Holly tries to solve the crime since her father is a main suspect. I read this one during the summertime, nowhere near the Christmas season, but it still made the magic A fun Christmas themed mystery - small town with quaint decorations and a likable heroine. I read this one during the summertime, nowhere near the Christmas season, but it still made the magic of the holiday come alive, almost too much so. I've never seen a town celebrate Christmas to this degree, but that's one of the fun things about themed cozy mysteries. Somewhat sanitized which is typical of many cozies, Holly isn't a perfect heroine. The love people have of her earrings is a little strange, and the stereotypical characters don't add much to the story, but the mystery itself isn't bad even if it's pretty hard to solve with the clues given. There isn't a big surprise or twist in there, it's more a story to read because you're enjoying the environment of a cozy instead of marveling at the creativity of the mystery itself. A wonderful cozy holiday mystery with a little bit of romance mixed in, set in the delightful town of Mistletoe, Maine. I listened to the audiobook and the narrator did an excellent job. I will be sure to read the rest of the series. Holly White has returned home to Mistletoe, Maine after a very abrupt cancelling of their wedding by her fiance. Once she's home she realizes she never should have left. Mistletoe is like a Christmas fairyland and she's anxious to participate in all the Reindeer Games that her mom and dad sponsor every year on their Christmas tree farm. That is, until someone is found murdered on the tree farm property and the place is shut down while they investigate. Holly tries to coax handsome Sheriff Gray i Holly White has returned home to Mistletoe, Maine after a very abrupt cancelling of their wedding by her fiance. Once she's home she realizes she never should have left. Mistletoe is like a Christmas fairyland and she's anxious to participate in all the Reindeer Games that her mom and dad sponsor every year on their Christmas tree farm. That is, until someone is found murdered on the tree farm property and the place is shut down while they investigate. Holly tries to coax handsome Sheriff Gray into letting them open sooner but to no avail. She is determined to find out who the killer is and clear her family and farm of any negative backlash. Someone starts making threats to Holly and the farm as well which makes her even more determined but can she investigate and still get out with her life intact? I absolutely loved this book! The blurb on the cover is right, it definitely got me into the Christmas spirit. Christmas is my favorite holiday to begin with and after reading this, I wish I could live in or visit Mistletoe, Maine! I like that Sheriff Gray wasn't one of those sheriffs that puts down the sleuth for investigating. He was actually concerned for her safety and even said they should work on the case together--although he had come to know Holly well enough that I think he realized there were going to be some things she'd still go out on her own and investigate. The newspaper reporter, Ray Griggs, wasn't the typical jerk reporter that some mysteries have had. I actually kind of liked him a little once I started to trust him--in the beginning I wasn't really sure he was who he said he was especially since Holly couldn't remember going to school with him. Maybe he would be a good one for Holly's friend Caroline ;) hehe, of course I'm Team Evan! I didn't completely guess the killer although the person had crossed my mind at times. I did have someone else in mind. The ending and reveal was very exciting and to me it couldn't have ended better! I can't wait for the next book, I'm that anxious to find out more about these characters that I would love to call my friends. When Holly White calls off her wedding, she returns to her family’s tree farm in Maine just in time for the annual Reindeer Games, which take place in the twelve days leading up to Christmas. However, the night before the games are set to start, Margaret comes in causing problems in her quest to keep the town exactly historically accurate. When Holly finds Margaret dead among the trees a few hours later, the police start looking a little too close to home. Can Holly clear her family and friends When Holly White calls off her wedding, she returns to her family’s tree farm in Maine just in time for the annual Reindeer Games, which take place in the twelve days leading up to Christmas. However, the night before the games are set to start, Margaret comes in causing problems in her quest to keep the town exactly historically accurate. When Holly finds Margaret dead among the trees a few hours later, the police start looking a little too close to home. Can Holly clear her family and friends before Christmas? If you are looking for a Christmas cozy, this one is perfect. Each page oozes Christmas cheer, and the games sound like a ton of fun. I’d love to visit and play myself. Unfortunately, I did feel this got in the way of the mystery at times, and Holly spent quite a bit to time reacting to events rather than actually investigating at other points. Still, it held together well overall, and we got a great climax. The characters are already sharp, and their relationships help add to the Christmas cheer. This is the debut book for the Christmas Tree Farm Mystery series. I was drawn to this book by the beautiful cover , the Christmas theme, and let's be honest who wouldn't be curious about a holiday themed cozy written by Jacqueline Frost. I'm glad that I was provided an ARC by the publisher because this was a delightful, whimsical debut of what promises to be a terrific series if this book is a preview of what's to come. It has everything that cozy mystery readers look for - wonderful characters This is the debut book for the Christmas Tree Farm Mystery series. I was drawn to this book by the beautiful cover , the Christmas theme, and let's be honest who wouldn't be curious about a holiday themed cozy written by Jacqueline Frost. I'm glad that I was provided an ARC by the publisher because this was a delightful, whimsical debut of what promises to be a terrific series if this book is a preview of what's to come. It has everything that cozy mystery readers look for - wonderful characters, a charming/quaint setting and an well plotted mystery that will keep the reader turning pages and guessing. A full review will be posted to my blog closer to the release date. A Christmas cozy mystery with all the elements that make a cozy good: interesting characters, a disliked victim, a small town where everybody knows everyone's business, and lots of suspects and clues with a little romance thrown in as well. Holly White has returned to her home in Mistletoe, Maine after canceling her wedding with only 2 weeks to go. Her parents run a Christmas tree farm and village there, and Holly jumps right in to help. Life becomes a mix of mistletoe, reindeer, fun activities A Christmas cozy mystery with all the elements that make a cozy good: interesting characters, a disliked victim, a small town where everybody knows everyone's business, and lots of suspects and clues with a little romance thrown in as well. Holly White has returned to her home in Mistletoe, Maine after canceling her wedding with only 2 weeks to go. Her parents run a Christmas tree farm and village there, and Holly jumps right in to help. Life becomes a mix of mistletoe, reindeer, fun activities around the village, and murder. This is not only the first book in a new cozy mystery series by Jacqueline Frost. She did a wonderful job with the mystery as well as the magical and cozy setting of Mistletoe Maine. Holly White returns home to Mistletoe after her fiance breaks off their engagement for another woman. Holly is sure that the family business, Reindeer Games Christmas Tree Farm, will be just what she needs to heal her broken heart and put her life back together. It is almost Christmas, so keeping busy is also on Hol This is not only the first book in a new cozy mystery series by Jacqueline Frost. She did a wonderful job with the mystery as well as the magical and cozy setting of Mistletoe Maine. Holly White returns home to Mistletoe after her fiance breaks off their engagement for another woman. Holly is sure that the family business, Reindeer Games Christmas Tree Farm, will be just what she needs to heal her broken heart and put her life back together. It is almost Christmas, so keeping busy is also on Holly's agenda. The Twelve Day of Reindeer Games at the farm, plus cookies and hot cocoa, are really packing in the tourists and locals. All is going well, until Margaret Fenwick. the head of the Historical Society, shows up with citations for Holly's father for not adhering to the historical code of the town. When Holly finds Margaret beaten to death, her body gruesomely stuffed into the Reindeer Games sleigh display the owners and staff at the tree farm immediately become suspects. Holly's father, Bud, was seen arguing with the annoying woman just before her death, making him look like a strong suspect. Holly knows her dad is not a killer, so in true cozy fashion, she is on the case to clear her father and find the murderer. argument with Holly’s father, Bud. farm or will she end up frozen to death? and cupcakes plus take a sleigh ride. workers, customers, neighbors and town people. I absolutely adored this book. The characters were charming and witty, the story was well written, and the mystery was clever and shocking. It's rare for a book to hit on all cylinders, but this one did. And while it was definitely a cozy mystery, it was unique in a couple of ways. One, the main character was in a lot more danger than is typical for a cozy. She was under fire for the majority of the book, which really made it an adrenaline pumping page turner. Also, while the father was warm and I absolutely adored this book. The characters were charming and witty, the story was well written, and the mystery was clever and shocking. It's rare for a book to hit on all cylinders, but this one did. And while it was definitely a cozy mystery, it was unique in a couple of ways. One, the main character was in a lot more danger than is typical for a cozy. She was under fire for the majority of the book, which really made it an adrenaline pumping page turner. Also, while the father was warm and loving, he was also tough as nails, prepared with his gun to take care of anyone threatening his family. All in all, I really recommend this book to anyone who enjoys cozies, especially Christmas ones. This one was particularly Christmasy, which I loved. Definitely a full 5 stars! Check out my blog for a photo and more in depth review. This book was an amazing first installment in the Christmas Tree Farm Mysteries. I can't wait for book two! Holly is back home in Mistletoe after her fiance dumps her a few days before their wedding. Back with her family in her childhood home, she is determined to make the best of her situation. When her father gets into an argument with Mrs. Fenwick from the historical society and then Holly stumbles over her body, chaos ensues. It doesn't help that the hunky new sheriff keeps telling her to ba This book was an amazing first installment in the Christmas Tree Farm Mysteries. I can't wait for book two! Holly is back home in Mistletoe after her fiance dumps her a few days before their wedding. Back with her family in her childhood home, she is determined to make the best of her situation. When her father gets into an argument with Mrs. Fenwick from the historical society and then Holly stumbles over her body, chaos ensues. It doesn't help that the hunky new sheriff keeps telling her to back off, but when the killer starts threatening Holly, sparks fly between her and Sheriff Gray, and Holly is more determined than ever to find out who is targeting her. As soon as I saw the cover of this book, I knew I had to read it. And believe me, I was not disappointed. I was intrigued from the time I started this book until I finished it. This is the first in the Christmas Tree Farm Mystery series and I cannot wait for more in this series. I liked that there were not a lot characters in this story, sometimes to many characters tend to muddy the story and make it hard to follow. When the president of the Mistletoe Historical Society is found murdered at Rei As soon as I saw the cover of this book, I knew I had to read it. And believe me, I was not disappointed. I was intrigued from the time I started this book until I finished it. This is the first in the Christmas Tree Farm Mystery series and I cannot wait for more in this series. I liked that there were not a lot characters in this story, sometimes to many characters tend to muddy the story and make it hard to follow. When the president of the Mistletoe Historical Society is found murdered at Reindeer Games, Holly, the protagonist, starts questioning the locals to try to take the spotlight off her family and any employees of Reindeer Games. Holly upsets someone bigtime with her questioning. I thought the plot of this book was very well thought out and believable. There were really very few actual suspects in this story, though with everything that happened to Holly she wondered if even the sheriff’s deputies could be the killer. Besides the mystery in this one, there were sparks between Holly and the Sheriff, Evan. I liked how their relationship developed. It was also fun reading about the Twelve Days of Reindeer Games, some of the antics had me laughing out loud. This one kept me turning the pages and I was very surprised by the reveal of the killer and why. Anxiously awaiting the next installment in this series. I won this book from the publisher through a Goodreads giveaway. Thank you to both. I really enjoyed this book. It had a nice mixture of a holiday story and a whodunnit mystery. The characters were all likeable and the town of Mistletoe, Maine came across as charming, not ridiculously sweet. My only complaint -- if you could even consider it a complaint -- is that for the type of story this is, it maybe could have been a little shorter; there were a couple parts I felt 3-1/2 stars rounded up to 4. My only complaint -- if you could even consider it a complaint -- is that for the type of story this is, it maybe could have been a little shorter; there were a couple parts I felt dragged a bit. Overall, an enjoyable holiday read, especially if you like a light mystery instead of a full on romantic story. Holly White has returned home to Mistletoe, Maine, but not for her Christmas Eve wedding. Confident that she actually dodged a bullet when her fiance left her for a yoga instructor, Holly is throwing herself into the Reindeer Game festivities at her family's Christmas tree farm. But when the president of the historical society, who had been wreaking havoc with several residents including Holly's dad, winds up murdered at the farm Holly finds she has more on her plate than Christmas cookies! Holly needs to get the farm back in business after it's closed to the public as a crime scene and decides to show that good looking sheriff that there are much better suspects than her family and the farm's employees. Reindeer Games Tree Farm is a magical place for a mystery. Filled with winter traditions and all the Christmas trimmings, reading this book made me want to snuggle by the Christmas tree and drink some of Cookie's special tea...even though my tree isn't up yet! Despite the joy to be found at the farm, there's also a killer on the loose adding fear and suspicion. I appreciate the fact that Holly visibly reacts to the threats and scary occurrences with realistic emotions. She's affected and struggles to deal with what has happened, but doesn't let it stop her from trying to find the killer. TWELVE SLAYS OF CHRISTMAS is a charming Christmas read, perfect for getting into the holiday spirit. I can easily picture it transformed into film and watching it on Hallmark Movies and Mysteries channel! It's a perfect holiday blend of mystery and romance with enough chills to be exciting and the right amount of sweetness to make you smile. The first Christmas Tree Mystery is a feel good story flavored with the joy of Christmastime as well as a good mystery!